Store manager is your basic set of tools to start up with. The very first step is creating a hosting store. Our user-friendly setup wizzard will help you get your site up and running with several clicks. Our ‘View Store’ section puts you in full control of the layout of your stores. You can also have a quick overview of your stores available by Domain or Subdomain or manage them and their custom settings in Advanced Mode. Note: Only in Advanced Mode your Reseller Control Panel shows the Manage E-mails menu. It enables you not only to set up mailbox(es) and aliases (only for stores using a domain), but also to receive feedback from your customers. Our easy-to-use “Create Store Wizard” will help you create your web hosting store in five quick steps. In less than tree minutes you can start earning money by offering Paid and Free web hosting to the world. This is the overview of your web hosting stores – the respective store name and its URL. You can also quickly access various store management options. This section allows you to assign your store regions and corresponding currencies, so that you can target local or world-wide customers. 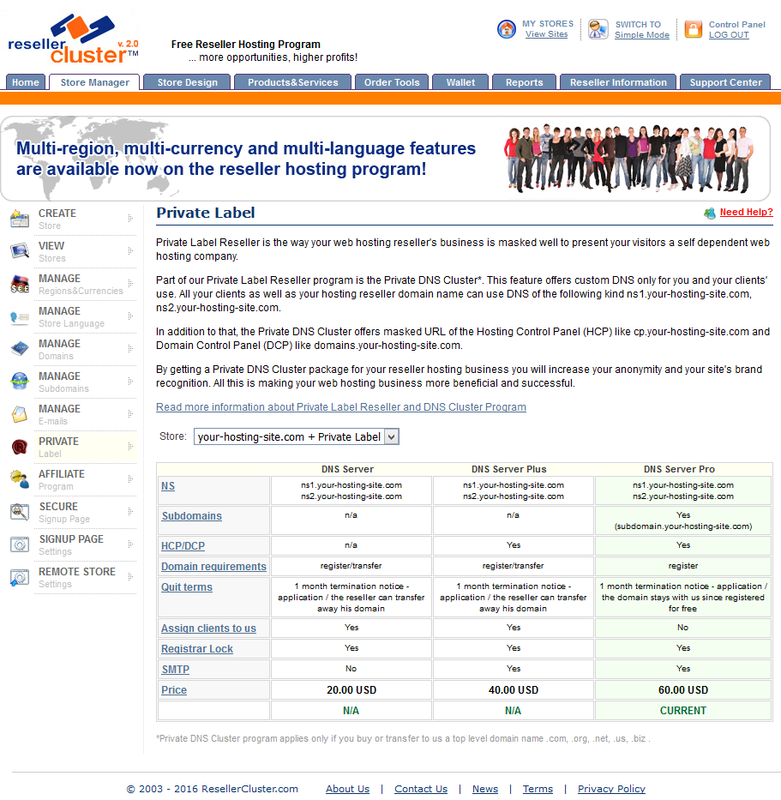 This section allows you to assign your reseller store template a specific front-end language. Shows your hosting stores and their domains. The domain propagation status and its corresponding DNS records. Shows your hosting stores and their subdomains. The subdomain propagation status and its ‘A’ record (the IP where the subdomain is pointed to). Helps you create email accounts and respective aliases of your store’s domains. Private Label Reseller is the way your hosting reseller’s site is presented over to your visitors and why they become clients of yours. Being a Private Label Reseller your reseller’s site will have the look of a self-dependent web hosting business. In this section you can also purchase our top-notch reseller hosting feature – Private DNS Cluster. This section allows you to enable the affiliate program on a specific store. This section allows you to configure the security and privacy of your signup/order page on the hosting store. Nowadays security is the most important key in any online business. We provide your hosting store with a default SSL certificate, operating at a default URL (https://order.runhosting.com). However, you can change that into your own private order URL like https://order.your-hosting-site.com and completely avoid any questions about why the order URL is different from the main website. Please note that you should have Private DNS activated for your store to use this feature ( Only DNS Server Plus and DNS Server Pro packages are eligible!). This section allows you to configure the URL of your signup/order page on the hosting store. Our reseller program offers you 3 different choices. However, please note that one of them is not secured by SSL certificate and thus we do not recommend it, since this might influence your signup rate due to lack of trust in your visitors. By default each store is configured to use https://order.runhosting.com with a valid SSL certificate. Additionally we offer a setup of private https://order.your-hosting-site.com with valid SSL registered especially for your hosting store. And last the (not recommended) non-secure private http://order.your-hosting-site.com option. This section allows you to configure the so called “retry order” and “payment link order” pages. Your clients can use these pages to complete the payments of either incomplete orders or custom orders created by our sales representatives.